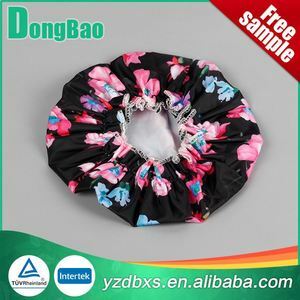 novelty disposable IDPE shower cap is made by polyethylene fabric which is keep hair dry when people take shower. 1. ARTICLE CODE: TB09901 2. SINGLE-USE 3. MADE BY POLYETHYLENE FABRIC 4. 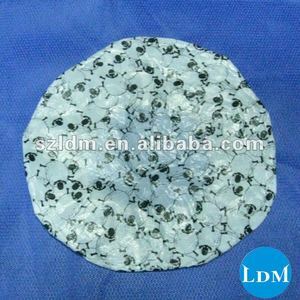 ELASTICATED EDGE FOR TOTAL HAIR COVER 5. LATEX FREE, FORMALDEHYDE FREE, COLOUR: TRANSPARENT;WHITE 6. SUITED TO HOTEL;HYGIENIC APPLICATION & DAILY USE 7. SANITATION AND QUALITY IN ACCORDANCE WITH THE ISO STANDARDS. 8. 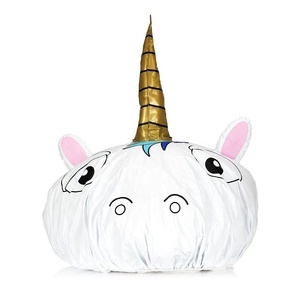 SIZE: 48CM;53CM;56CM;61CM 9. PACKING: 100PCS/BAG, 1000PCS/CTN. 4.We have been producing the products for more than 7years, we have much experience and definitely trustworthy. We have advanced production equipments such as the covering machine, sealing machine and high frequency machine. The products are selling to Taiwan China, Japan, South Korea, America, France, UK and other European countries. (5) High quality, competitive price and quick delivery time Additional service Professional guidance in material or design adjustment which help you get the most ideal cost effective solution. Shipment port: Shanghai Packing 1)200 PCS per carton; 2)opp bag+ outer carton; 3) as customer's requirement Note: 1.Please kindly inform us the materials, thickness, size, printing colors and other special requirement of your product. We can give you special offer; 2.We can produce various packaging bags and packaging films according to your requirements. 2.we emphasize high quality of products to responses to clients. 3.we guarantee the products be delivered on time according to the contract. We guarantee the products of best quality and lowest price! 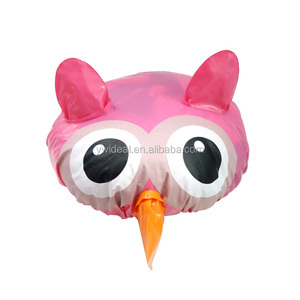 3.Design for baby,size can be adjusted according to the baby's head. 4. Prevent water and shampoo into the eyes, ears when baby bathing . Usage: 1.Put on the cap closer to ears when baby bathing or haircut. When wash your baby's hair, water will not run to the baby's face. To prevent the shampoo & water touches the baby's face. Make the shampoo a funny experience for the kids. But it may bring some cost, it depends on the qty and the packing itself. 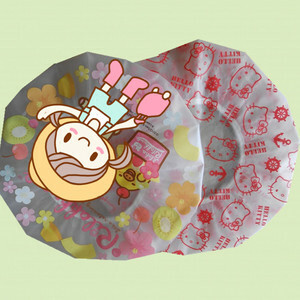 e will double check the quality ,packing and qty before shipping, and we will take potots if needed. We provide Tracking No after shippment, you can track the parcel situation on the way easily. OEM Available, we can produce as your design. Promise Excellent quality, Competitive price and Service guarantee. 3. Accept OEM design: can produce any designs as your requirements. 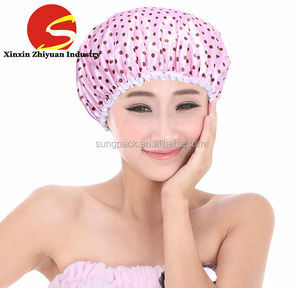 Alibaba.com offers 111 novelty shower caps products. About 58% of these are shower caps, 7% are bath brushes, sponges & scrubbers, and 1% are hotel amenities. 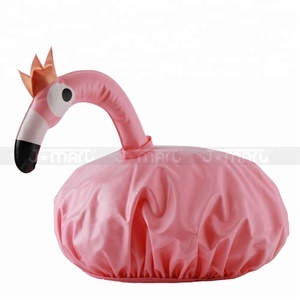 A wide variety of novelty shower caps options are available to you, such as eco-friendly, stocked. You can also choose from free samples. 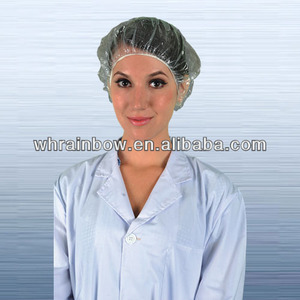 There are 111 novelty shower caps suppliers, mainly located in Asia. 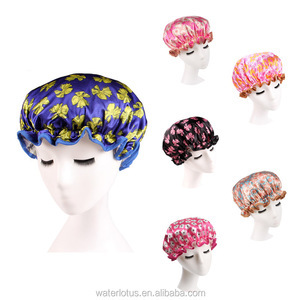 The top supplying country is China (Mainland), which supply 100% of novelty shower caps respectively. 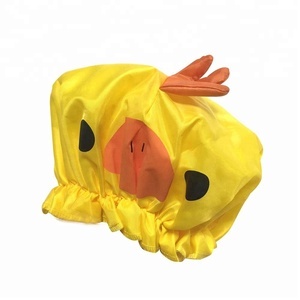 Novelty shower caps products are most popular in North America, Western Europe, and South America. You can ensure product safety by selecting from certified suppliers, including 39 with Other, 13 with ISO9001, and 4 with ISO13485 certification.